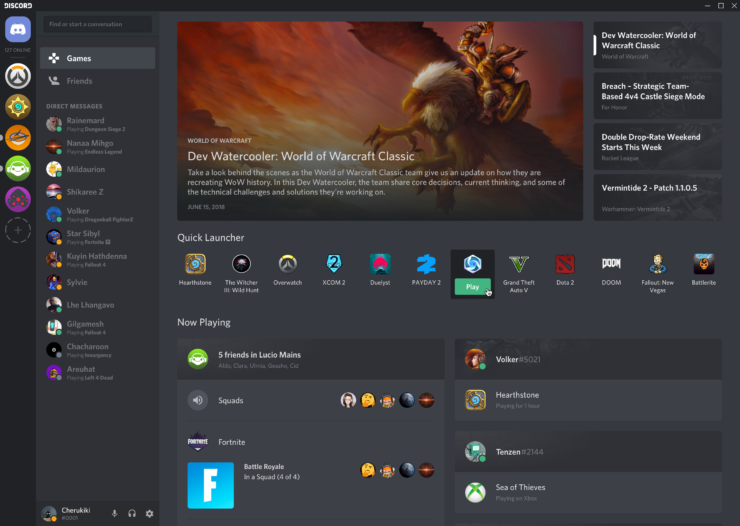 Mere days after Steam had expanded its chat and group features to make it more akin to Discord, Discord has done the exact reverse by launching the so-called Games tab. News about games you play. Launcher for games you play. What your friends are playing right now. What your friends recently played. Your friends’ Spotify listening parties, Twitch streams, and Xbox status. Want to save a few clicks getting into your game? Discord can quickly launch any game that has recently been played on your PC. With just a single click you’ll be able to get right to playing. We’ll get you set up with a quick view into what your friends are currently playing. How do we know who to add? Good question. Anyone on your friends list who you chat with will automatically show up. If you don’t have a lot of friends on Discord yet, we’ll also toss in users who you have talked to in voice chat recently, along with others from servers you chat on. Depending on the game being played you’ll get a quick view into who is taking part. If they are a member of one of your servers and in a voice channel, you’ll be able to quick jump over to the server so you can join in the conversation. If the game being played supports direct invites through Rich Presence, you can even join into the game right from this screen. Not seeing one of your best (new) friends show up? You can easily add them. Feeling a little cluttered? Uncheck the box, and they’ll no longer show up in the games tab. Note: Your Games page will only display info for 100 different Discord Users. In addition to being able to jump directly into a game, you’ll also be able to see Spotify listening groups, join Twitch streams in progress, and see what your friends are playing on Xbox. Heck, if you’re late for a voice call in one of your servers, you’ll even be able to join that from the Games tab! Along with being able to keep up with what all your friends are playing, you’ll have the ability to see what is going on with your favorite games. The latest updates / patch notes / clips will be available in the ‘What’s New’ section. Just click on the name o’ the game to pop out all the latest news.